Pudget: Losing Weight On a Budget! : Join In On The Fun! I am so excited about our newest contest! Of course the contest part makes it fun but getting past our plateaus together is so exciting! I can't wait to reach my 50 pounds lost and it is so close. Once I get past this plateau I will be there and then I can post another picture in my side bar. I'm so excited! I hope you are all as excited about this contest and doing "The Pudget Plateau Busting Formula" with me. I'm sure this is going to be awesome for all of us stuck at a plateau but it can be equally awesome for just about anyone trying to lose weight. So even if you aren't stuck at a plateau, please feel free to join us. The results are going to be amazing! I'm posting the information from yesterday in case anyone missed it. Read to the very bottom to find out how to enter the contest to win one of my favorite items that has really helped me with my weight loss. I have already received several great ideas and I can't wait to read all of the one's that come in today. Keep them coming! Please feel free to join me on this journey to say goodbye to my plateau and Hello to the 160's. It's going to be really strict but if we follow it we will do great and get past our plateaus. Step 5: This one I am leaving up to all of my readers! Please send me and email to let me know what you think step 5 should be. Then we can all vote on it and add the winner's idea to the list. 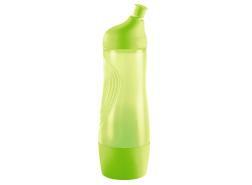 The person with the winning idea will win my favorite Tupperware Water Bottle!!!!!! Plus a few little extras that I will announce later. Email me your best idea by Tomorrow evening July 3, 2010 at 11:59pm to be considered in this contest. If a duplicate idea wins I will chose the winner from that group from a hat. The same will be done in case of a tie. I wanted to mention something that one of my dad's doctors told him since he is supposed to be losing weight. She recommended that he eat an apple or a pear before he eats lunch and dinner. The idea is that he is filling up his stomach with a low calorie, high fiber food and then will need less on his lunch/dinner plate. This is working well for him. I'm not sure if this is something that could help you as well, but I wanted to mention it. Go, Jessica...you can get to that 50 pound mark! What a great challenge! Count me in!! I think this is a great idea. I have been stuck on the same plateau since OCTOBER!!! I go up a few pounds, down a few pounds...... but just can't break that 165 mark. I don't know what else to do. Well, I do know what to do, I'm just not accountable to it. This will definitely fill in that piece. Hmmm...my suggestion that has worked for me in the past and that I need to reinstitute now that I've gained 10lbs back is to wait 1/2 an hour after eating a meal or snack before even considering having more. So often when I get hungry I eat to contentment, consuming easily 600-1000 calories when really if I just had 400 calories and allowed those calories to enter my bloodstream and do their "thing" I would realize that I'm not hungry anymore. So my thought is to slow down when eating, savor every bite and allow more time for the calories to work...instead of wolfing down way to many calories way too quickly.